Find My Workspace lists over 95% of the business centres market in Long Hanborough. Simply click Request Quote to check pricing for one office, or Add to Basket for multiple offices. This centre has a newly refurbished modern serviced office building offering the perfect solution for a start up or expanding small business. For flexibility the centre offers an easy in easy out one month rolling contract. 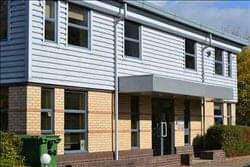 The offices are fully air conditioned and can be furnished or unfurnished. There is 24 hour access and parking. Other amenities on site include, showers, kitchen and an on site manager. It has on site parking as well as local on street parking.